This post contains affiliate links to Amazon.com products that I find helpful in painting my nails. I used to have horrible nails. Streaky and clumpy… I was a nail painting reject. I thought I would forever need to get salon manicures because I could never master the process at home. I was wrong. 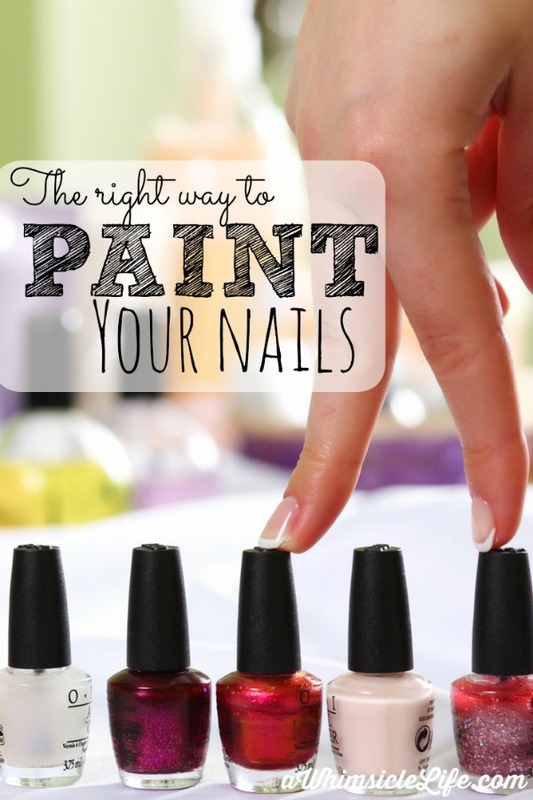 I just didn’t know the right way to paint nails. I use a cuticle remover gel and a cuticle pusher . I squeeze the cuticle remover gel onto my cuticles, let it sit for about 15 seconds and then push the cuticles back. Make sure to wipe the remaining gel off of your fingers immediately. I recommend washing your hands to remove it thoroughly. Using a buffer, I buff each nail to even out the surface. Before I paint, I wipe down each nail with white vinegar or a nail cleanser using a cotton pad. This will remove any oils or dirt to allow the nail polish to adhere to your nail. I start with a base coat. First, I dip my nail brush in the base coat. Then, I apply a small dot of the base coat to the center of my nail. I wipe the remaining base coat off my brush. I use the brush to push the dot of base coat to my cuticle stopping short of the skin. Then, I swipe up to the tip of the nail. Next, I go back to the base of the nail by the cuticle and I swipe up on the left side of the nail. Go back to the base and then swipe up the right side. One nail done! I repeat for the rest of my fingernails and then I let the base coat dry completely. I follow the exact same technique and I paint on two coats of polish. Then, I apply a top coat. When I’m done and I’ve let my nails dry completely (this is the hard part for me), I have a perfect, smudge-free, clump-free manicure. If you are one who constantly chips her nails, you may want to try another solution.